We came over to Santa Cruz on Monday, spending the last half hour motoring at 8 knots to try and get in before dark, which we managed to do, just. The entry to the anchorage at Santa Cruz is straightforward, but it is difficult to work out where it is safe to anchor in the dark, when you don't have the sun highlighting the patches of reef that lie just below the water. Yesterday we went on a boat tour of the bay, which included some interesting snorkelling sites plus some good wildlife viewing opportunities. 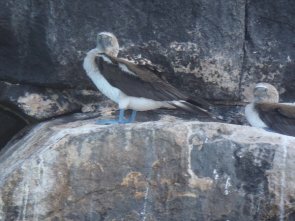 It is the first time we have seen the blue footed boobie close up. Here is a picture of a booby looking particularly boobiesque.